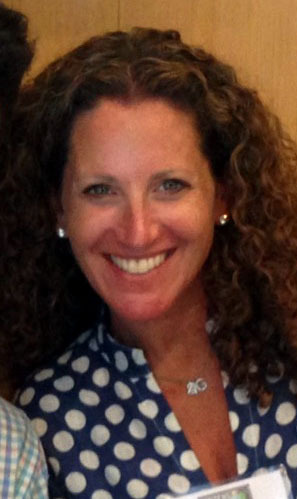 Washington – In the spring of 2013, Tara Cook-Littman was on the front lines of the struggle to pass a Connecticut law requiring the labeling of food containing genetically modified organisms. But Congress is moving to take back the ground food labeling advocates like Cook-Littman have won. Last month, the U.S. House of Representatives voted 275-150 to approve “The Safe and Accurate Food Labeling Act of 2015,” a bill that would create a federal standard for the voluntary labeling of foods with GMO ingredients. It would pre-empt mandatory labeling laws, such as those approved in Connecticut, Vermont and Maine, arguing that they are unnecessary and costly because GMO’s have already been deemed safe by the Food and Drug Administration. Even at its best, Connecticut’s decision to pass the nation’s first GMO food labeling bill did not pan out exactly as Cook-Littman had hoped. Pushback by the nation’s grocers and some farm groups led to a compromise: as adopted, the law contains a trigger that will only allow it to go into effect once Northeast states with a combined population of 20 million adopt similar laws. The trigger was written into the law in part because state lawmakers were reluctant to allow Connecticut to go it alone in the legal battles likely to ensue when agricultural corporations are ordered to be fully transparent. “It was the only thing that would pass in Connecticut, and we felt it was more important to get something on the books,” said Cook-Littman, head of the board of directors of Citizens for GMO Labeling. She said advocates are now “gearing up to go back to the Connecticut legislature asking them to remove that trigger,” since Vermont and Maine have also passed GMO labeling laws. She will instead be working on saving what she has already achieved. “People are just outraged, our Congress is completely controlled by industry,” she said. “People have a right to know what kind of food they are getting when they buy them off the shelf,” he said. Genetically modified seeds are engineered in laboratories to have certain traits, including higher tolerance to herbicides, which, critics say, are overused and potentially damaging to the environment. Much of the nation’s corn and soybean crop is now genetically modified. Genetically modified corn is used in high-fructose corn syrup, which sweetens soft drinks and candy and in corn starch. Soybeans, canola and sugar beets are also genetically modified. In fact, the food industry says about 75 percent to 80 percent of foods available to American consumers contain genetically modified ingredients. The bill, Kennedy said, would create a single, unified standard for food to be labeled as “GMO free” with which food companies and farmers could voluntarily label their products. He said the industry would work to get a similar bill introduced in the Senate in the fall. Sen. John Hoeven, R-N.D., is the most likely sponsor of that legislation. Actress Gwyneth Paltrow snaps a selfie with Sen. Richard Blumenthal during a GMO-labeling advocacy event. Her mother, actress Blythe Danner chats with Sen. Jon Tester of Montana. The nation’s grocers and agribusiness have celebrity advocates on their side — Microsoft founder Bill Gates, for example, whose foundation has funded GMO research. Gates said genetically modified crops, “have reduced billions of gallons of insecticide use” and help poor farmers boost their yields. “There have been some substantial benefits,” he said. But those critical of genetically modified foods also have their celebrity allies. 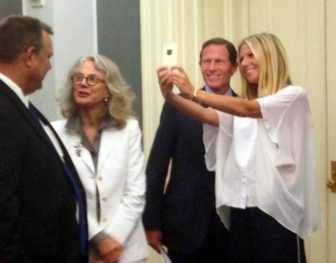 This week, actress Blythe Danner and her daughter, Gwyneth Paltrow, attended a Capitol Hill press conference with Sen. Richard Blumenthal, D-Conn., to promote legislation the senator co-sponsored that would require the labeling of genetically modified foods. Rep. Rosa DeLauro, D-3d District, is a sponsor of similar legislation in the House. But legislation backed by Blumenthal and DeLauro is not likely to advance in a GOP-controlled Congress, Cook-Littman said. So activists are meeting in Waltham, Mass., this week to develop strategy on how to beat back congressional efforts to quash mandatory GMO labelling and protect and advance the progress they have made in states like Connecticut. “We’re working so all the [state] laws are similar so it is not a patchwork,” she said. Maine’s law has a trigger, like Connecticut’s. But Vermont’s does not and is scheduled to go into effect next July. There are dozens of GMO labeling bills pending in other statehouses, where lawmakers are waiting, and watching, what will happen in Connecticut and Congress. Cook-Littman said the GMO fight is a “David vs Goliath” struggle. “We haven’t lost yet,” she said. GMO labeling — Wise, useful or misleading?